Senator Edward M. Kennedy said yesterday that President Bush's Iraq policy is ''ridiculous" and disputed Bush's statement that the 2004 reelection validated the war. Iraq is ''Bush's Vietnam," Kennedy said. Bush, in an interview with The Washington Post published yesterday, said, ''The American people listened to different assessments made about what was taking place in Iraq, and they looked at the two candidates, and chose me." 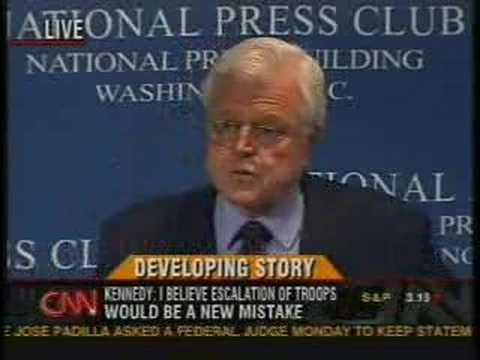 Kennedy has been a leading opponent of the Iraq war. He opposed the 2002 vote to give President Bush the authority to wage war in Iraq -- a vote he called "the best vote I've cast in my 44 years in the United States Senate" -- and has called for a withdrawal since January 2005. Kennedy called Iraq a "quagmire" and drew repeated comparisons to Vietnam, a tactic that Democrats are likely to repeat in the coming months.